Mindfulness and acceptance based approaches such as (Acceptance Commitment Training (ACT) and Mindfulness Acceptance Commitment (MAC) are gaining momentum with sport psychology practitioners who work to support elite athletes. These acceptance based or third wave cognitive behavioural approaches in sport psychology highlight that thought suppression and control techniques can trigger a metacognitive scanning process, and that excessive cognitive activity and task-irrelevant focus (self-focused attention such as trying to change thoughts) disrupts performance. Using this perspective, the aim of sport psychology interventions is not to help the athletes engage in the futile task of managing and controlling internal life. Rather it suggests that sport psychology practitioners should work to increase athletes’ willingness to accept negative thoughts and emotions in pursuit of valued ends. Key aspects of such interventions include: teaching athletes to open up and accept; teaching athletes to mindfully engage in the present moment, and helping athletes formulate the values and engage in committed actions towards these values. 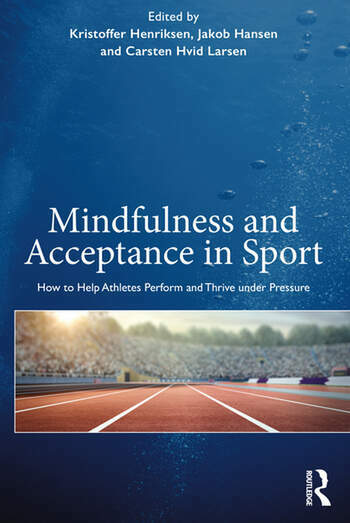 The goal of Mindfulness and Acceptance Approaches in Elite Sport then is to provide students, researchers, practitioners and coaches of sport psychology with practical guidance for implementing mindfulness and acceptance approaches in their work with athletes. Bringing together highly experienced practitioners and sharing their working methods, exercises and cases to inspire the sport psychology profession. 1. Mindfulness and Acceptance Approaches: Do They Have a Place in Elite Sport? Kristoffer Henriksen is an associate professor at Institute of Sport Science and Clinical Biomechanics at the University of Southern Denmark, Denmark and head of the research unit ‘Learning and talent in sport’ (LETS). He is a sport psychology consultant in Team Danmark, the national Danish elite sport institution. Jakob Hansen is a full-time private performance consultant in sport, business and other performance domains. From 2008-2018 he worked for Team Denmark (the Danish Elite Sport Institution). Carsten Hvid Larsen is an associate teaching professor at Institute of Sport Science and Clinical Biomechanics at the University of Southern Denmark, Denmark and sport psychology consultant in Team Denmark, the national Danish elite sport institution.